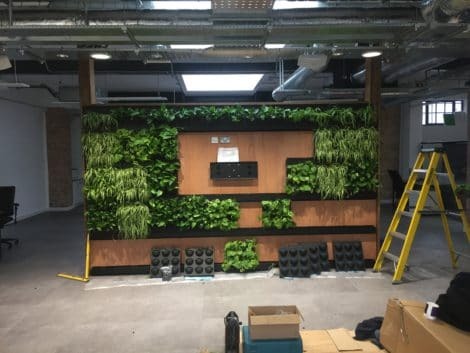 This LivePanel installation was expertly prepared and created by Just Plants, Bristol. 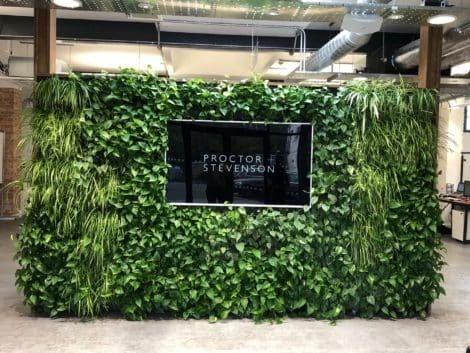 The newly constructed blank wall gained LivePanel love at Proctor + Stevenson, a marketing and communications agency in Bristol, and now enjoys a simple blend of plants to add a welcoming sprinkle of nature in its reception area. With the lack of a water source and its lowly-lit aspect, the LivePanel suited perfectly. A little natural light from above and some artificial LED lighting meant that plant choice would be crucial – and steered Just Plants and the client towards grasses and foliage. The simple plant choice includes chlorophytum, epepremnum aureum and philodendron scandens, creating a variegated blend of greens and golds. The installation was completed in January 2018, taking a busy morning and a full day to install and plant up the panels. The wall structure itself was built from scratch so it was critical to work in harmony with a local carpenter, particularly as the wall would also incorporate a TV screen. A typical UK winter’s day in January meant that the plants were acclimatised within a heated van prior to their planting – minimising any potential shock.